We were Face-timing our beautiful sister in law and niece this weekend and we got to talking about back pain and how having a child can contribute to this in more ways than one. From pregnancy itself, carrying your babe on one hip to putting a baby in a car seat (have you mastered the art of buckling a baby in while bending your knees?? ), it’s so important to look after ourselves as well as our baby. According to the Australian Institute of Health and Welfare, 3.7 million people reported back problems in 2014-15, and it’s estimated that most of us (70-90%) will suffer from lower back pain at some point in our life. And it’s not just babies – stressful, busy lifestyles and life/work balance challenges can cause back and neck problems and exacerbate any existing conditions. Just the postures we adopt to interact with the technology that is supposed to be helping us exist these days is causing us stress and pain. So why does this happen? How do we get back pain? There are some medical conditions that cause or contribute to back pain, however we are actually have more control over whether we experience this uncomfortable and sometimes persistent pain than we realise. 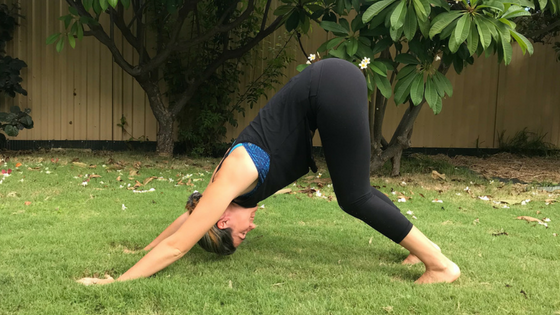 Think about how you are sitting right now… are all of your natural spinal curves in the right position, head position perfectly above the shoulders, lower back supported, feet grounded on the floor? Or more likely, you have hunched shoulders, forward rounded spine, chin close to chest as you read this on your phone. We’re doing garden renovations at home at the moment… do you know how hazardous DIY can be ??! Heavy bags of sand that are carried on the hip, long planks of wood that are unbalanced, constant bending over to dig through limestone – hard and risky work if you aren’t bending your knees and engaging your core. Even a box of your favourite tipple could be putting you at risk! That’s roughly 15kg for your mixed dozen. There are plenty of web search results promoting fear and spending around treatments for back pain. At Mala we do not subscribe to this approach and prefer to promote self care and a holistic, sustainable option for everybody. So what’s the solution? Staying active is a highly effective way to manage back pain. Yoga in particular will take your body through a range of movements to stretch and strengthen your back and core muscles. Being mindful of your body position, keeping your core engaged, spine upright when bending and lifting. Rolling your shoulders back and using lower back support when sitting, especially when at a desk for extended periods of time. So next time you’re playing tug of war with your puppy (our fur baby Olive is heading towards a sturdy 12kg now! ), remember to engage those muscles, bend those joints and play gently. And then scroll down for a few asana (postures) to stretch it all out – click on the infographic for all of the details. 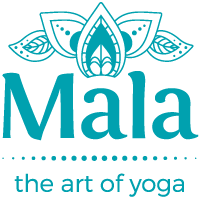 If you’d like to explore ways to support your back health and more, visit us at Mala Yoga – 10 Wray Avenue, Fremantle.